Ballistic results for this propellant show it to be highly versatile, with low residue in a myriad of pistol cartridges. It has similar burn rate to Winchester 231, Hodgdon Titegroup®, and Accurate No. 2®. This propellant can be used in virtually all pistol cartridges, and 12 gauge shot shell target loads. A fine grain spherical propellant, it meters extremely consistently with volumetric chargers. When used with certain shot shell reloading machines, it is recommended that a PC-PB-2 Powder Baffle be installed to ensure proper machine/propellant interaction. Due to the gas generation rate of this propellant, loaders can achieve high velocities with .45 Auto, .38 SPL, and .45 Colt and similar low-pressure cartridges. This propellant will also enable cycling and nominal velocities in high-pressure semi-automatic firearms chambered in 9mm, .40 S&W, .380 Auto, and others. Additionally, this propellant can be used for reduced loads in virtually any revolver cartridge, whether magnum or standard. 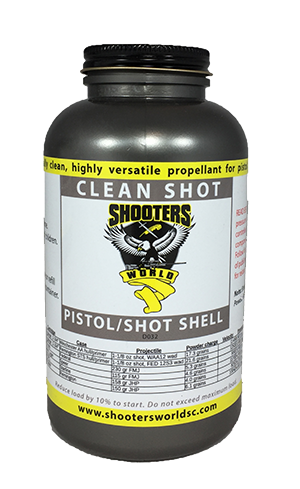 Clean Shot is a canister form of Explosia bulk propellant D032-02. Ballistic load data using European CIP test methods and standards for D032 propellant is available here.